Scarlet by A.C. Gaughen. Bloomsbury, 2012. Currently Available. Face Value: I’m neutral on this cover, which doesn’t have any major flaws but is boring. Sure, the girl looks appropriately androgynous and is a fair match for the description of Scarlet in the book (if a little more vacant in the eyes), but if I hadn’t already heard good things about it I would never have grabbed it off a library shelf. Does it Break the Slate? Mostly yes. There is a ton of Slatebreaking in this novel, what with our tough protagonist who disguises herself as a boy and fights better than most of them. And there’s some really excellent analysis of what it was like to be a woman in this time (not great). However, even our heroes are not exempt from this societal ills of the time, and I had a real problem with the way even some of our good characters like Robin and John talk to and treat women, without any kind of repercussion or understanding. Who would we give it to? Definitely anyone who is fond of these stories is going to find something to enjoy here, and I actually think there might be a real audience in The Hunger Games crowd as a book about another fierce young woman who knows her way around her weapons. Review: This book was good for me because it helped me to get over my Robin Hood biases. I’ve never been a huge fan of the story, honestly, because the typical portrayals of Marion leave something to be desired and beyond that it’s a bunch of boys running around a forest feeling superior. Regardless of whether or not that’s fair, it’s my mental image of the story, and I’ve never sought out material that might make me think otherwise. 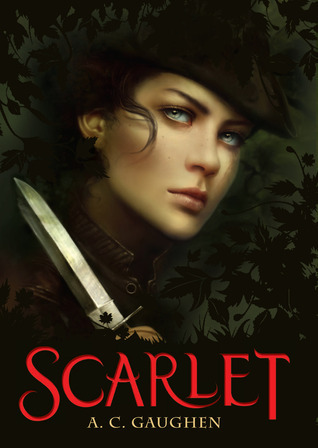 However, I’d heard good things about Scarlet, and I love stories that take known source material and add a feminist spin, so the idea of a female Will Scarlet among the band of merry men was decidedly interesting to me. And I’m really glad I read it! Despite some flaws, I think that this novel actually gives us a fascinating look at a pretty gruesome time in history, when the Crusades were going on and the people of England were being taxed out of survival. And of course, among that we have the legend of Robin Hood. There are so many stories about him that it’s not clear whether he was a real person, a combination of several people, or just myth and legend, but regardless, he stole money from the wealthy so that the rest of the community could afford the crippling taxes being put upon them. He and his band are deeply committed to their community, and work to keep their fellow countrymen safe from the Sherriff and his men. As I’ve mentioned in this review, it’s not a story that I ever fell in love with, but there was an appealing grittiness to this version – less about heroics and more about survival. The familiar characters are present in this book, although all are given a little more depth. The biggest switch, of course, is that the brooding, daring Will Scarlet is actually a girl in disguise, and since we hear the story from her POV we know the most about her. But we also learn hidden depths to all of our characters, building more than simple tropes. One of the nice details of the book is that Scarlet’s identity isn’t exactly secret – all of her band knows she’s a girl, she just lets people make the assumptions they’re going to make, and poses as a boy. The greater community knows her as Will Scarlet, but we’re spared the “gasp, she’s going to have to bathe in the river with the boys” exploits we so often see in this kind of story. And having the rest of the gang in on the secret actually allows for a couple of much funnier moments. It also helps the with the plausibility of her story – I totally believed that she was capable of both her exploits as a thief and of keeping her secrets. There are bigger secrets at play (which you’ll probably figure out as you read along, but I won’t ruin for you) than simply Scarlet’s gender, and she has good reasons to be suspicious and afraid of her identity being discovered. When the thief-taker Gisbourne is brought to Nottinghamshire, things get bad for Scarlet as well as the rest of Robin’s crew. This middle section is where I really felt we got a meaningful glimpse into what the world was like for women at this time, and how limited Scarlet’s options were. It’s very compellingly told, and takes a strongly Slatebreaking stance that doesn’t oversimplify the oppression in place. My problem with the book, however, is that even though the narrative takes a critical stance on misogyny, it’s still instinctively demonstrated by the male characters we’re supposed to love. If a character calls a woman a whore out of anger, and that is implicitly forgiven, that shouldn’t be ok, even if it’s a character we’re meant to like. We have to hold our heroes to the same standards we hold our villains. And while there are complex layers to both the male and female characters in this book, I still found myself disappointed in the romance, and the subtle implications embedded within it. This entry was posted in Reviews, Young Adult and tagged gender bending, Historical Fiction, Retellings, Robin Hood. Bookmark the permalink. Great review! You bring up some really great points that honestly hadn’t occurred to me before. And like you, I’ve never been too big a fan of the original Robin Hood myth, but I think the edgier feminist take did a lot toward making me a fan of the original story, though I definitely prefer this version.